As online video advertising grows on a global scale, many platforms are looking to capitalize on this opportunity and to capture some share of TV advertising revenue. Among these platforms, Facebook is looking to launch a new video ad format later on this summer. There has been no official announcement as yet, but it is rumored that the video ads will appear in the newsfeed and auto-play without sound. It will then be possible to activate the audio and the video will restart from the beginning. Each video will last a maximum of 15 seconds, suggesting Facebook has taken note of Vine’s offering – which is limited to a 6 second video format. A small number of big brands will be part of the initial trials, including Unilever, Nestlé, Ford, Diageo, American Express and Coca Cola. To create more impact (at least at the beginning) users will only see video content from one of these advertiser’s in any one day. The ads will be bought on a cost per thousand basis with rates predicted to be in the low $20s, a cost per engagement model is not currently being considered. Facebook has up to 70 different ad types already, so what will make this new format stand out from the rest? 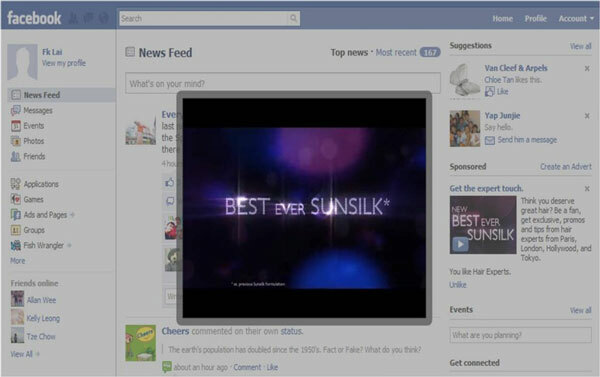 It allows Facebook to tap into the rapidly expanding online video advertising market - 41% growth Y.O.Y, US 2012. The new ads are expected to generate up to US $1.5m new daily revenue and up to $4m per day by the end of the year. Some brands, such as Unilever and Volvo have already conducted research into how TV and social video can link together to drive lifts in brand awareness and ad recall. Facebook’s new video format will offer a new source of consumer data for advertisers that can feed into such research. The customary consumer uproar that accompanies the launch of ad products on social platforms will undoubtedly ensue; the auto-play feature is likely to be the most talked-about change. There is also the possibility that users could learn to ignore the ads as they will be easily identifiable as ads. This problem could be avoided if Facebook make the ads work in the same way as sponsored stories, as users are more likely to watch a video which has been validated by their friends first. Consumers naturally share video on Facebook, so the introduction of video ads in the newsfeed seems to be a natural addition to the social giant’s large bank of ad formats. There is no mention of whether this video format will extend beyond desktop, but with large volumes of people now watching video on their mobile and Facebook beginning to prove its revenue potential through the channel (30% of its revenue in Q1 this year was on mobile), it is likely to be in the plan.